One of today’s common self-care options for pain management and soreness is to use a foam roller. A common problem area that many people have is the Iliotibial band (ITB). The IT band is located on the outside of the thigh and it has many functions, anatomy of the ITB will be discussed later, and overuse can lead to pain and tension in the area. One common practice today is to use a foam roller on the ITB in an effort to gain relief from pain and tension. Foam rolling the ITB should not be performed. In the following paragraphs the Iliotibial band, why people use a foam roller on the ITB, and why those same people should not be using a foam roller on the Iliotibial band will be discussed. 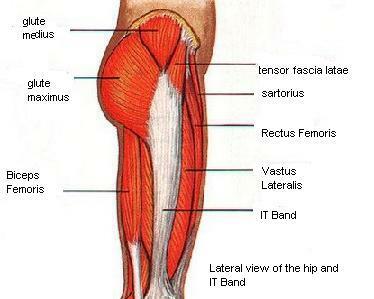 The thickening of the fascia on outside of the thigh is considered to be the ITB (figure 1). On the proximal end (closest to the hip) of the femur it attaches to the Tensor Fasciae Latae (TFL) as well as attaching to the tendon of the gluteus maximus. At the distal end (closest to the knee) the ITB attaches to Gerdy’s Tubercle on the anteriolateral (front outside) aspect of the Tibia, or shin. The band has no contractile force in of itself; it merely tightens with the muscles it is atta ched to. The iliotibial tract can be considered as an anterolateral knee stabilizer, particularly its capsular-osseous layer. It also plays a role in hip extension, abduction (drawing the hip away from the midline of the body), and lateral rotation of the hip (rotating the hip out). The ITB is used in all walking, running, and cycling activities. Why are people foam rolling their IT bands? When the glute max and TFL get tight from overuse they will both have a tensioning effect on the ITB. This will cause the ITB to further restrict and adhere, or stick, to the vastus lateralis, the muscle on the outside of the thigh. As the ITB constricts and adheres to the vastus lateralis this has a tendency to cause the area to become ischemic, or lacking blood flow. Generally speaking the ITB gets foam rolled because people experience pain, tension, and discomfort due to this ischemia. As previously stated the ITB is used in all walking, running, and cycling activities. Those who experience discomfort in the ITB are generally experiencing it because of overuse doing the aforementioned activities. A weak gluteus medius could also have an effect on the ability of the ITB to stabilize the lateral knee, thereby causing discomfort. Iliotibial bands should not be foam rolled because the ITB is not a muscle. It is a large area of connective tissue that attaches to muscles. When those muscles get tight they have a tensioning effect on the ITB causing it to adhere to and restrict the vastus lateralis, causing ischemia. When a foam roller is used on the ITB, it is only compressing the ITB on to the vastus lateralis further increasing this restriction, and in turn causing more ischemia. Using a foam roller and further pressing the ITB on to the vastus lateralis could cause an increase in restriction, adhesions, and ischemia and it could be causing further dysfunction and not helping as people are often lead to believe. It would be more effective to foam roll the muscles the band attaches to than the ITB itself. When the glute max and TFL are balanced, tensioning and restricting effects on the ITB will lessen allowing the band to relax and be freed from the underlying vastus lateralis. This in turn will reduce the ischemic effect thus reducing pain and discomfort. To generate even better results massage cupping can be used on the ITB. A massage cup is a small plastic, silicone, or glass cup that is used to provide suction when applied to the body. After releasing the glute max and TFL a massage cup can be suctioned on to the ITB and moved in the direction of proximal to distal (hip to knee). This suction will grasp and lift the ITB off of the underlying vastus lateralis, which will in turn promote blood flow and reduce ischemia, further reducing pain and discomfort.